I just got my commission to be a Notary Public in California so I figured I’d notate the steps to get it. The Qualifications are taken directly form the Secretary of state website. Just because you have a criminal record doesn’t mean you can’t become a notary. It depends entirely on what the conviction was for and how much time has passed. Unfortunately they won’t give you an answer as to if you’ll be approved or not until you go thru the entire process and pay all your fees. Here’s the Disciplinary Guidelines page and here’s a link to the 2012 Disciplinary Guidelines PDF. And even if you do not get approved after the initial review (like everyone goes thru) you can request an administrative review as to why you think you’d be a great notary. This was taken form the first page of the “Notary Public Disciplinary Guidelines 2012” handbook. (1) Nature and severity of the act, offense or crime under consideration. (2) Number and/or variety of current violations. of the applicant or commissioned notary public. (4) Actual or potential harm to the general public, group, individual or customer. (5) History of complaints received by the Secretary of State. (6) Prior disciplinary record or warning from the Secretary of State. (9) Prior disciplinary record of occupational, vocational or professional license. certificate of rehabilitation or dismissal of the offense. from the applicant or other sources, or may deny the application. or may deny the application. (14) Reports generated by law enforcement agencies. OK, so your over 18, a California resident, and you think you’ll pass a background check. Now you need to take your required 6 hour education if you are a new notary or a 3 hour refresher course if you are a renewing notary. Your not eligable for the 3 hour class if your commission has already expired, so don’t wait till the last minute. To locate vendors who have been authorized to provide an approved notary public education course, please refer to our list of approved vendors. They are listed by county. I’m in Alameda County, the list currently shows 195 organizations who are approved. Once you pass you’ll be given a certificate good for 2 years. So you can take the state test any time within that 2 years. Now you need to register for an exam by contacting Cooperative Personnel Services (CPS); and you need to take a 2 x 2 passport photo and staple that to your notary application form. Other Notary forms are here. A score of at least 70 is required to pass the exam. Exam results will not be discussed over the telephone. Now it’s time to bite your nails and WAIT to see if you passed. It takes roughly 15 days to get results. Now you need to get fingerprinted. Before submitting fingerprints via Live Scan, applicants must first take and pass the notary public exam. Applicants who fail the exam will not be required to have their fingerprints taken until passing the exam. Applicants must have their fingerprints taken within one year of the exam date. If fingerprints are not taken within one year of the exam date the applicant will be required to retest. The Request for Live Scan Service(pdf ~442KB) form is available online. Important: A notary public commission will not be issued until a report from the DOJ and the FBI is received stating that there is no criminal history. If the report identifies any criminal history, a notary public commission will not be issued until the criminal history is reviewed, evaluated, and found to be non-disqualifying. For Live Scan locations and business hours see the DOJ’s website at ag.ca.gov/fingerprints/publications/contact.php. A completed Request For Live Scan Service (pdf ~442KB) form. So now you wait to see if you pass the background and you filled everything out correctly on the application. Here are current processing times. As of today 12/07/12 they are processing applications from 09/22/12. So it will take just under 3 months to get your applications back. When I did mine it took about 6 weeks. a list of Authorized Manufacturers of Notary Public Seals. If you took the exam at least six weeks prior to the expiration date on your current notary public commission, your new notary public commission will not be sent to you more than 30 days before the expiration date. Once the notary public commission packet has been received, the next step would be to purchase the notary public supplies. A notary public is required to purchase and file an official bond with the county clerk’s office in the county where their principal place of business is located within 30 calendar days from the commencement date of the commission. (Government Code section 8213.) 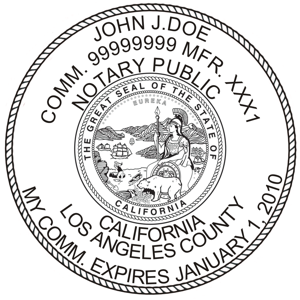 Once you get your notary packet from the state of California buy your bond the SAME DAY! It’s going to take the bonding agency a week to mail the bond paperwork back to you and you only have 30 days total once you get notary public paperwork from the state to file. A notary public may utilize any bonding or insurance company of their choice. Check the local telephone directory’s yellow pages under the heading “Bonds”. A list of Secretary of State authorized seal manufacturers will be mailed with the notary public commission packet. These are the only manufacturers that are authorized to make notary public seals. So now your have your bond. A notary public must file an oath of office and bond with the county clerk’s office in the county where their principal place of business is located. This must be done within 30 calendar days from the commencement date of the commission. This 30 day period cannot be extended. It is recommended that the oath and bond be submitted in person to guarantee timely filing. (Government Code section 8213(a).) Don’t mail it in, go in person! Do you really want to take that awful test over again because the mail man lost all your paperworkor the paperwork came in 1 day too late? The bond is designed to protect the public, not you. I’d highly recommend getting Errors and Omissions insurance. It’s fairly reasonable. I got a quote for one year of $25,000 insurance for $33.00. I got a quote for $100,000 of insurance for $156.00. This is California and if you screw up someones house paperwork, you could be in for a rude awakening. I’d buy the most you can afford for your business; especially if you own many assets that are paid off. I ended up going with the National Notary Association because they offered the initial education, the state test, live scan fingerprints and took my photo’s all in the same day. They are recognized and well known all over the United states as well; although I feel their pricing is a bit high. In one LONG day almost everything was done. Get a good nights sleep the night before and drink some coffee, it really is a long day. This entry was posted on Friday, December 7th, 2012 at 1:29 PM	and is filed under Misc.. Both comments and pings are currently closed.